EA was hoping on Star Wars: Battlefront II to be its big holiday hit earlier this year. However, leading up to the game’s release, it ran into a fair share of controversy with its “loot box” system, with people wondering just how much its “pay-to-win” strategy could ruin things. The publisher reiterated that it was no big deal, but, at the last second, pulled the plug on microtransactions (at least, temporarily) following some pressure from Disney. But the damage may have already been done, at least as far as EA’s stock is concerned. 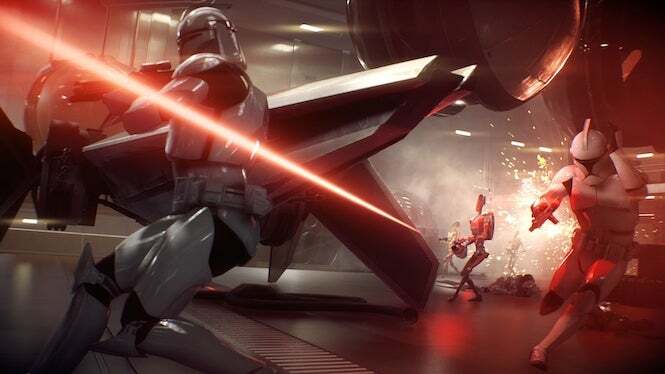 EA previously gave a December quarter sales forecast that did drop below some Wall Street estimates back in October, with some showing concern for Battlefront II as a result. Just a day later, the shares fell about four percent. And it appears that the negativity surrounding the game is hurting its chances on the market as well. The first week the game was on sale in the U.K., sales were reportedly in a 61 percent decline over what the original Battlefront sold back in 2015, and the game hasn’t managed to get into Amazon’s top 100 list for best-selling games for the year to date, at least as of last Tuesday. So now, the big question is what will EA do. It’s insisting that the microtransaction system will eventually make its way into the game, but considering how badly it’s hurt Battlefront’s chances (not to mention Need For Speed: Payback, which also had a tiresome grinding system at launch), it may want to back off and give the game a chance to recover. Some companies are already getting involved in the “loot box” controversy, with the state of Hawaii and Belgium alike insisting that it’s some form of gambling. With that, a Wall Street analyst believes that EA should take the time to right the ship, instead of focusing so much on how it can make additional money from the game. "Battlefront II is the pointy tip of the iceberg...the biggest recent controversy has centered around EA's Star Wars Battlefront II, where early evidence suggests player anger over a mishandled loot box economy may in fact be impacting initial sales," Cowen's Doug Creutz noted earlier this week. "We think the time has come for the industry to collectively establish a set of standards for MTX implementation, both to repair damaged player perceptions and avoid the threat of regulation." This looks to be a serious wake-up call for Electronic Arts to reconsider its monetization system, and instead maybe get back to making games fun as they have in the past. Whether it’ll take this route has yet to be seen, but this road is certainly a lot bumpier than the company anticipated. Star Wars: Battlefront II is available now for Xbox One, PlayStation 4 and Origin PC.